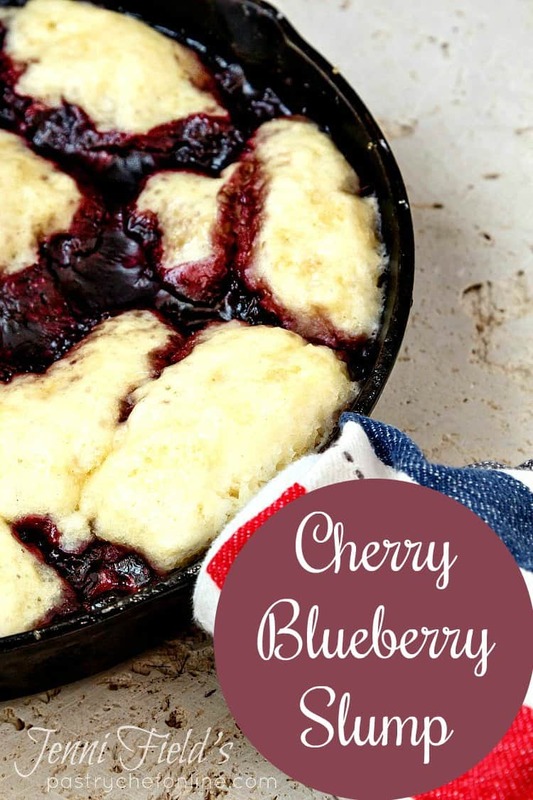 Cherry Blueberry Slump | Old-Fashioned Fruit Dessert: No Oven Needed! 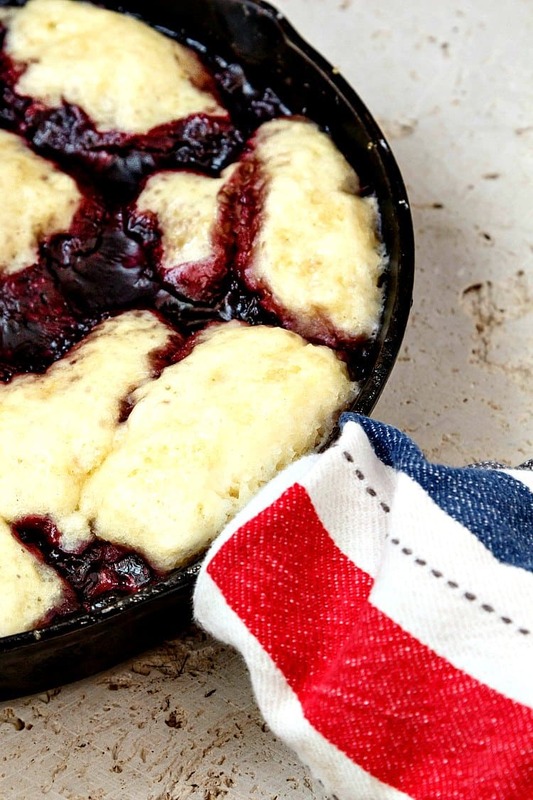 Home » Cherry Blueberry Slump | No Need to Heat the Oven for Cobbler! Meet the cherry blueberry slump. You may also have heard it referred to as a grunt. As a matter of fact, here’s my Mixed Cherry Berry Grunt recipe. You’ll see how similar the two are. The main thing to know about the slump, or any fruity dessert that has a dumpling or biscuit component is that they are pretty much all related, so don’t get too hung up on the names. Just enjoy them for their sweet, homey simplicity. When you come across a fruity/biscuity dessert, here are some general guidelines that will help you figure out what sort of fruity dessert you’re enjoying. Keep in mind that most rules are made to be broken, hence: guidelines. You can use whatever fruit you have handy–fresh or frozen–to make this cherry berry slump. I will say, though, that the sweet cherry-blueberry combination is pretty excellent. To the fruit, and this is completely optional, I did add about 1/4 teaspoon of freshly ground mahleb to the mix. Mahleb is ground from the seeds of some sort of Iranian sour cherry tree. No, I’m not kidding! If you’ve never had it, it will still feel familiar to you, or it did to me, at least. The flavor is sort of a floral-almond that plays particularly well with cherries. If you don’t have mahleb, you can substitute just a touch of almond extract and maybe a pinch or two of ground mace. Before we make this guy, I want to make sure you have the ingredients and equipment you need to make your life easier. This 9″ cast iron skillet is a workhorse in my kitchen, and it’s also the perfect size for this dessert, yielding 6 generous or 8 regular portions of slump. I love my induction burner because it runs even cooler than a regular single burner. With induction, only the pan heats up and not the air around the pan. This helps keep your kitchen cooler. I’m adding mahleb here as well because, while optional, it is a pretty magical spice. It’s fantastic in this cherry blueberry slump, but you can also add the ground seeds to sweet baked goods. I find myself reaching for it fairly frequently, because it imparts such a subtle but wonderful extra dimension to enriched yeast dough. Last but not least, you’ll appreciate this 9″ lid that can fit on your 9″ skillet. It’s made for melting cheese onto burgers, but it also will work really well to trap heat and moisture to steam your dumplings. 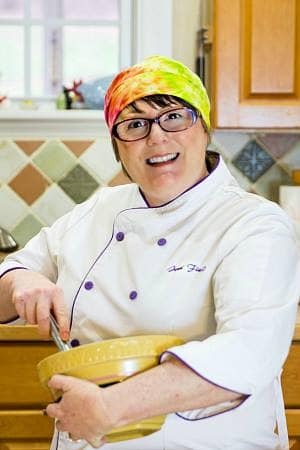 If you dig the sound of this recipe, please consider rating and/or commenting. I love to hear from you! And if you make it, please share it with me, either on Instagram tagging @onlinepastrychef and using hashtag #pcorecipe or over on the Pastry Chef Online Facebook Group. Okay, let’s proceed with the cherry blueberry slump, shall we? 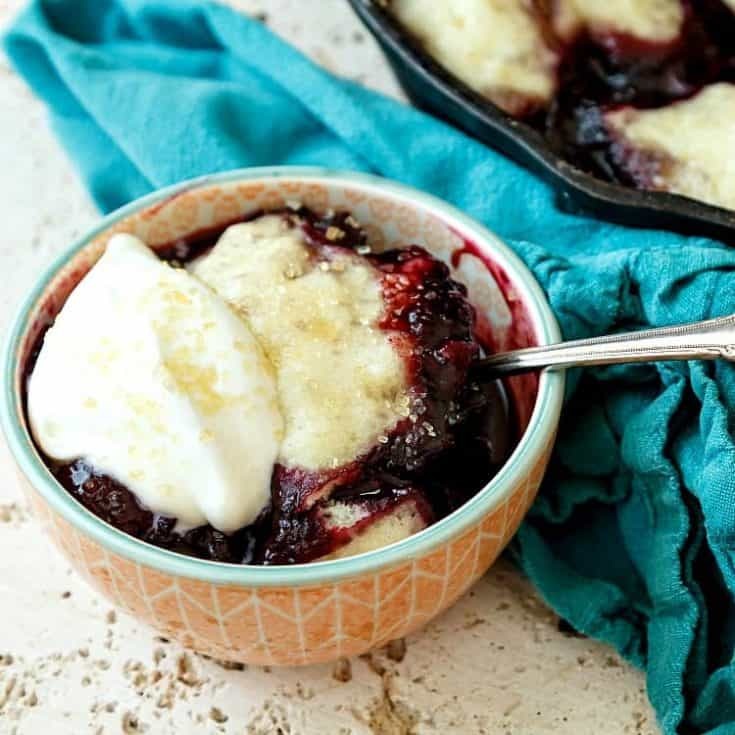 The cherry blueberry slump is an old-fashioned, homey dessert that is pure fruity comfort food at its best. Since it cooks on the stove top, make a slump rather than a cobbler to keep your kitchen cool and still enjoy a fruity dessert. In a 9" skillet, combine all the ingredients and toss well. Heat over medium heat and bring to a boil. Cut the butter into small pieces and then rub into the dry ingredients until mealy. You don't need big chunks of butter showing, but if you have a couple, that's okay. Nothing bad will happen. Pour in the milk and fold together gently but thoroughly. Allow to sit for a couple of minutes to thicken up. Drop the dough/batter by large spoonfuls onto the bubbling fruit. It's okay to have fruit showing between the dumplings. Put a lid on the skillet, adjust heat to a simmer, and let the slump cook for about 20-22 minutes. Dumplings will be firm to the touch but slightly sticky. Remove the lid and cook an additional 5 minutes to let the dumplings dry. Cool to warm before serving with a dollop of very lightly sweetened, softly whipped cream, a bit of sour cream, or some creme fraiche. Or ice cream. And there you have it. This slump, or any slump really, is a great summer alternative to cobbler since you don’t need to turn on your oven. Enjoy! We eat a lot of blueberry grunt in these here parts! I’ve never met a grunt, slump, cobbler, sonker, buckle, pandowdy, crisp or betty I didn’t like.